Christopher Hastings previews a Marvel Legacy showdown with Doom! On October 11, UNBELIEVABLE GWENPOOL #21 sees everyone’s favorite comic-manipulating character meet her doom…Victor von Doom! Written by Christopher Hastings with art by Irene Strychalski, Gwen joins the age of Marvel Legacy by coming head to head with one of the most iconic baddies in the Marvel Universe. Gwenpool brings her best—breaking fourth walls and fighting Doctor Doom—in chapter one of this two-part story! We spoke with Christopher Hastings to get a sense of what Gwenpool gets herself into with issue #21. Marvel.com: How does Gwen match up against Victor von Doom? Christopher Hastings: Right now, Gwen’s greatest strength comes from her newfound ability to see and interact with the actual elements of the comics page. She can walk out of a panel and jog back through the gutter space to travel through time. She can tear up pages. She can grab word balloons out of the air. Basically, she’s learned to manipulate the reality that Doom exists in—as powerful as he may be inside of it. Marvel.com: What are her limitations in this fight? Christopher Hastings: As I said, she’s still learning these powers. She often gets surprised by their limits—and to Doom, she may appear to just be some sort of low-level reality manipulating sorcerer, while he’s a master of magic. Marvel.com: Why does Gwenpool want fight Doom in the first place? 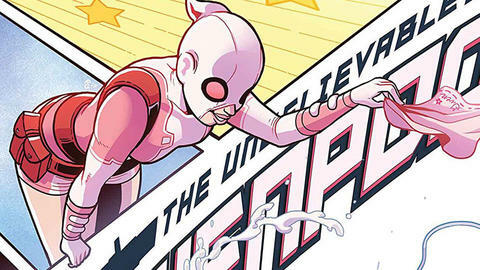 Christopher Hastings: Throughout Gwenpool’s series, she’s been dying to be on the same level as her favorite heroes, but she continues to get stuck in the trenches with those she perceives as third-rate—Howard the Duck, M.O.D.O.K., Batroc the Leaper, Vincent the old Doombot that wears a sweater vest. Gwen wants to prove she’s important in this world and she’s decided that means tangling with the biggest baddie she can find. Marvel.com: What are the dynamics between these two like at the start of issue #21? UNBELIEVABLE GWENPOOL #21, by Christopher Hastings and artist Irene Strychalski, drops on October 11!